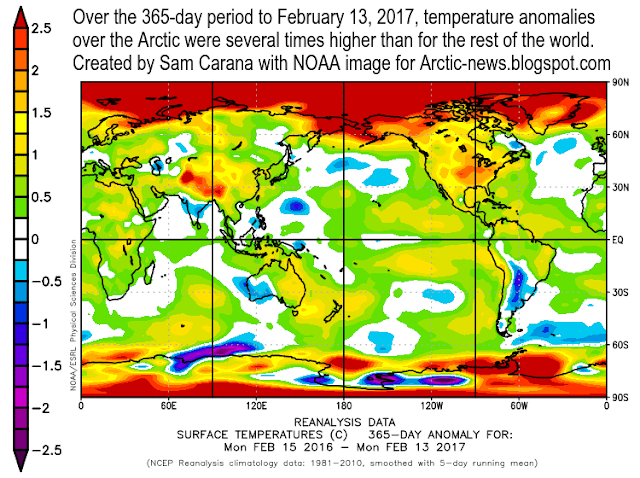 Above image shows temperature anomalies over the Pacific Ocean on February 12, 2017. Note the 19.2°C (34.5 °F) anomaly off the coast of Japan, at the location marked by the green circle. 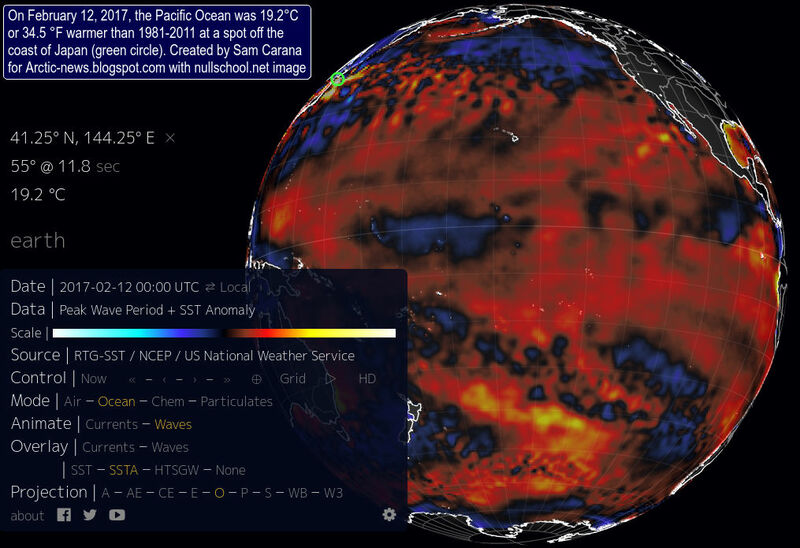 In 2016, the annually-averaged temperature for ocean surfaces around the world was 0.75°C (1.35°F) higher than the 20th century average, higher than the previous record of 2015, NOAA reports. The global annual land surface temperature for 2016 was 1.43°C (2.57°F) above the 20th century average, surpassing the previous record of 2015 by 0.11°C (0.19°F). Note that NOAA uses the the 20th century average as a baseline, for more on different baselines, see this earlier post. There is more heat on the way, as illustrated by the image below. As above image shows, the El Niño-Southern Oscillation (ENSO) temporarily raises (El Niño) or suppresses (La Niña) global temperatures. Generally, the stronger the event (El Niño or La Niña), the greater its impact on the average global temperature around that time. Note that one value for 2016 literally went off the chart. 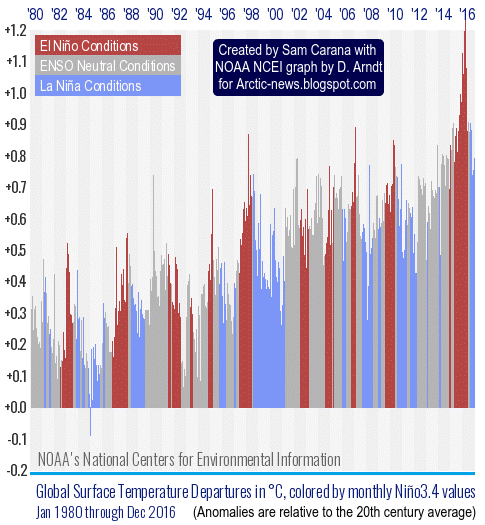 As above image shows (at the end of the graph on the right), we've barely had a bit of a La Niña in 2017 and we're already facing another El Niño event. Above images shows ECMWF (European Centre for Medium-Range Weather Forecasts) plumes with strong positive anomalies in all three El Niño regions (on the right). In other words, temperatures in 2017 look set to be very high, which spells bad news for the Arctic where temperature anomalies are already several times higher than in the rest of the world, as illustrated by the image below. As the image below shows, Antarctic sea ice extent was at a record low for the time of the year on February 11, 2017. 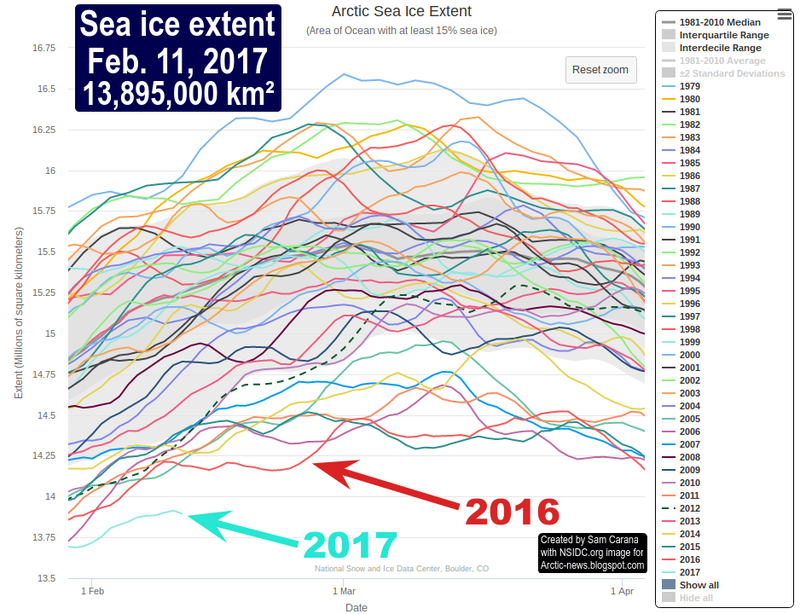 The situation looks particularly grim for the Arctic sea ice. 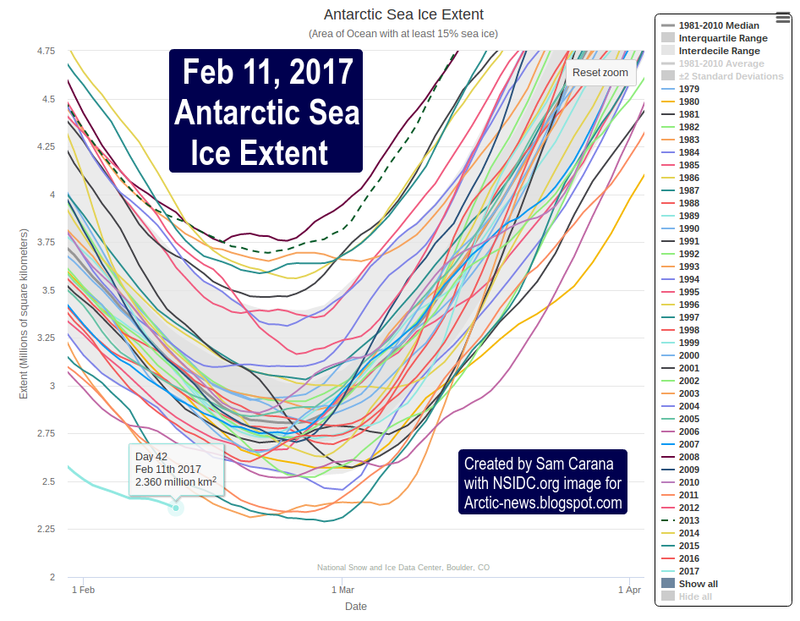 As the image below shows, Arctic sea ice extent on February 11, 2017, was also at a record low for the time of the year. In fact, it had fallen to 13,895,00 km² that day, raising the question whether perhaps the maximum for the year 2017 had already been reached. Low global sea ice extent means that less sunlight is reflected back into space by the ice and that more heat is instead absorbed by the ocean, adding to the predicament the world is in. The situation in the Arctic is crucial, as huge amounts of methane, contained in sediments under the Arctic Ocean, could be released if warming continues, potentially triggering mass extinction of species, including humans, within one decade. Why so few people are talking about it? Shouldn't we take drastic measures and try everything we can with geo-engineering?